Irakli Kobakhidze, Speaker of Georgian Parliament, recently outlined proposed constitutional changes. Among them is a switch to a fully proportional electoral system, for which civil society groups have long argued. But this possible switch could end up restricting political competition. This pending reform would produce three major changes. First, it would do away with the current mixed system of determining parliament’s composition by eliminating first-past-the-post races, and relying solely on party-list voting to allocate seats. A second change would re-allocate votes for parties that fail to clear the 5-percent electoral threshold (the percentage needed for a party to gain representation in parliament), and give those votes to the leading party. The last change, which is ironic coming from a party that came to power as a coalition, would prohibit parties from forming electoral alliances. Taken together, some experts caution that the proposed rule changes could tilt the electoral playing field in favor of the incumbents, and thus would mark a setback for civil society. In order to test the claim that the proposed reforms could skew democratic development in Georgia, and how the changes might affect future elections, the Caucasus Research Resource Centers (CRRC) calculated how seats would have been distributed among parties in the past three legislative elections. The CRRC model looks at three variants, including the mixed system that Georgia currently uses. The CRRC model also applied the criteria that the parliament speaker proposed on March 21, under which there is only the proportional, party-list vote, along with the re-allocation rule that gives the leading party the votes received by the parties that fail to clear the 5-percent hurdle. 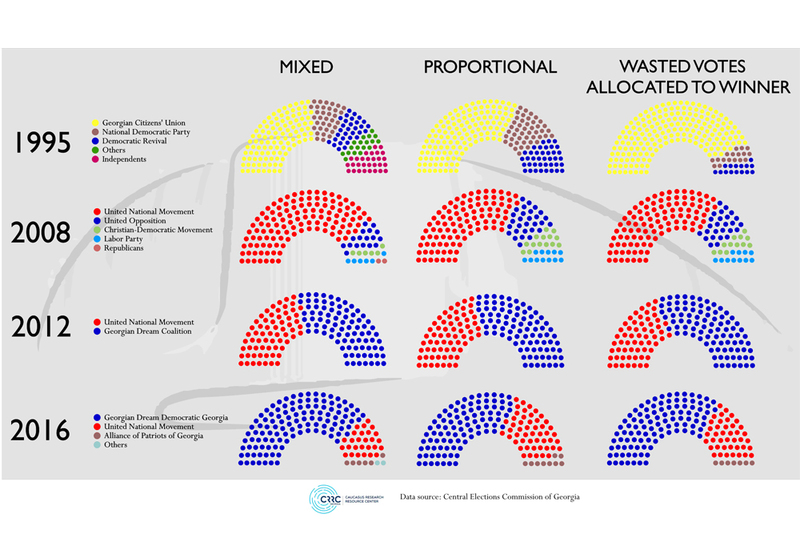 In addition, the CRRC model shows how MP seats would be distributed on the basis of a proportional-vote system with a 5 percent threshold, but without the re-allocation provision. The CRRC model shows that in the 2008 and 2016 elections, during which there was only one strong party in the country, the incumbent party would have ended up with roughly the same number of seats under the current mixed system and the proportional-only system with the re-allocation rule. The incumbents would lose a significant number of seats, yet still retain a safe majority, under the system of proportional voting without re-allocation. There would seem to be a genuine danger that the proposed rule changes would give the incumbents a decided advantage in a race in which two parties are otherwise evenly matched. The 2012 election underscores this point. That race, which matched the Georgian Dream coalition against the United National Movement (UNM), was close and intense. When the results are run through the CRRC model, the parliament would have almost the same seat allocation under a fully proportional system as under the current mixed system. However, if the votes for parties that did not clear the 5-percent hurdle were re-allocated as Speaker Kobakhidze suggested, it would favor the winner, when compared to a proportional system without the re-allocation rule. While the proportional system that Georgian Dream proposes might appear to mark an improvement over the current system in some cases, under circumstances where there is a high level of political fragmentation, such as is currently the case, the changes would provide a significant boost to incumbent authority. To highlight this phenomenon, a detailed look at the 1995 Georgian parliamentary elections is useful. In the 1995 vote, over 50 parties vied for seats in the legislature, and 62 percent of ballots were cast for the parties that did not clear the 5-percent hurdle and thus were ineligible for representation in parliament. Had the electoral system in 1995 been the one that Georgian Dream is currently advocating, rather than 107 seats, the Citizens Union of Georgia would have won 187 seats in what was a 235-member legislature. Georgian Dream, which came to power as an electoral coalition, is also proposing a ban on electoral coalitions. This rule, in combination with wasted votes being allocated to the winner, is likely to further benefit incumbents. Each party would either have to run independently or form a new political party to run together in elections. In practice, this rule obstructs electoral consolidation, which often promotes the formation of stable parliaments in a genuinely pluralistic system. If implemented in its current form, it is likely the new rule would increase the number of seats in parliament awarded to the party with the largest share of the vote. Even without this change, Georgia’s political parties have already been fragmenting in recent years. Georgian Dream was once a six-party coalition, but now consists of a single large party (Georgian Dream) and two minor parties (the Conservatives and the Social Democrats). The remaining parties that formed the original coalition are now independent. Meanwhile, the United National Movement (UNM) has broken up into a number of parties, starting with the 2012-2016 parliament, when UNM members split to form Girchi and New Georgia, and more recently, when a majority of the party’s MPs broke off to establish the Movement for Freedom - European Georgia. Another matter of potential concern is the question of dark money in the electoral system. It is possible that incumbents, acting through shadowy intermediaries, could potentially provide assistance to small parties in order to draw votes away from potential competitors. This strategy has already been part of political competition in Georgia. When the UNM controlled parliament, for example, the Christian Democrat party was effectively a satellite party. This strategy may have also been at play in some of the splits from the United National Movement. Both Girchi and New Georgia, after splitting off from the UNM, were able to immediately open up a large number of offices throughout the country. It remains unclear where the money came from to afford such a significant expense. The proposed electoral reforms could face opposition from civil society, and President Giorgi Margvelashvili could veto them. However, Georgian Dream holds a constitutional majority in Georgian parliament, meaning it could overturn a veto, as MPs did in response to past vetoes. For Georgia’s democratic political system to become stronger, the consolidation of parties, not further fragmentation, is needed. The proposed changes to the electoral system are unlikely to encourage consolidation, and instead seem to provide lots of incentives to encourage the continued fragmentation of the political landscape. At best, the proposed changes are two steps forward and one step back. At worst, they could squash political competition in Georgia. Dustin Gilbreath is a Policy Analyst at CRRC-Georgia. David Sichinava is a Senior Policy Analyst at CRRC-Georgia.